What was the exciting news? Embrilliance was nominated for TWO Reggie awards this year! 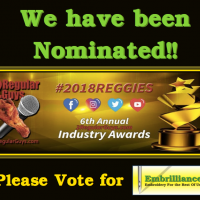 The Reggies are an annual online award that are put out by the commercial embroidery podcasters 2 Regular Guys Podcast This is the 6th year for the Reggie awards. I am THRILLED that Embrilliance was nominated for best new product 2018 (for StitchArtist 3D foam underlay) as well as for Company that provides the best customer service! I am also pleased as peaches that my friend and colleague Erich Campbell is also nominated for Best Industry Ambassador, Best Guest on the 2 Regular Guys Podcast (Craft vs Industry: the home market’s effect on professional decoration), Most Influential Young Star 2018, Best Industry Educator, and Best Online Educational Content (www.ErichCampbell.com). 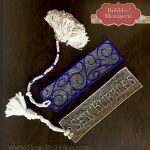 Those that follow my blog and SewBubbles page on Facebook know that I share Erich’s blog posts and articles on a regular basis. I love that he writes for the commercial embroider-er BUT the content of his posts make perfect sense to the home market as well. To be nominated for a Reggie is a prestigious honor as there are very few industry awards. Nominations for the various categories were held earlier this month – and it was incredible to have so many Embrilliance owners take the time to send in their nominations. But now I have a request from all of you that follow me and my blog 🙂 It would mean alot to me if you would vote in this process for Embrilliance and my friend Erich. It doesn’t take long, and every vote counts. As a thank you for taking the time to vote, I want to give you three free embroidery designs – all created with StitchArtist software. I provide you with the BE working file so that you can open the file into any Embrilliance program and save to your format. By providing you with the BE format, if you have StitchArtist, you can also see all of the objects and the settings that I have used to create these designs. 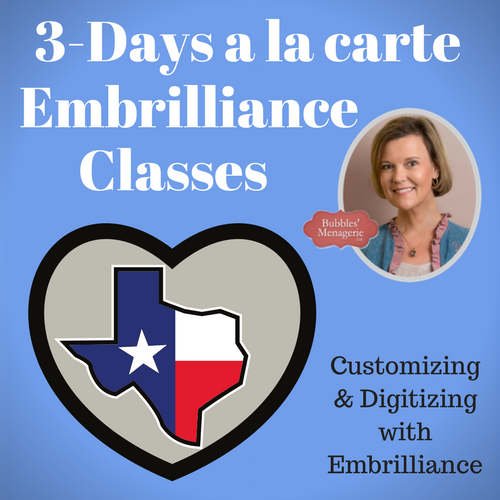 This is a great way to learn new techniques such as free standing lace or applique. You can download the zipped file that contains these three designs here. A few notes on the designs: The bookmark – this Free Standing Lace design was created using features of StitchArtist Level 1. I know it’s pretty darn incredible all that you can do in this budget priced full digitizing program. Traveling stitch runs are shown so that there are no jumps in the swirling stitches. A travel stitch is simply a single run that relocates the needle instead of jumping. The applique sewing machine was also created in StitchArtist Level 1 (lettering is using Block font) and one of the tips I like to point out is that the finishing stitch of the applique stops where the start of the bean stitch starts – moving your start and stops can eliminate jump stitches! 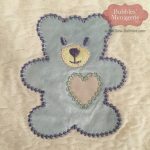 The teddy bear applique was done in StitchArtist Level 2 because I like the control of the satin column for the facial features. I had also done the bear’s finishing stitches as French Knots which is a feature of Level 2 and although the texture was nice, I ended up changing to a motif run which looked similar with less stitches. 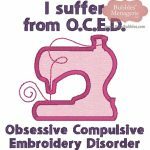 My sample was stitched on silk charmeuse so I did not want all of those extra stitches. Voting ends on December 15th, 2018. If you choose to share this post so that your friends can get the free designs AND hopefully vote for Embrilliance and my friend Erich – that would make me very happy! Thank you again for taking the time to vote! 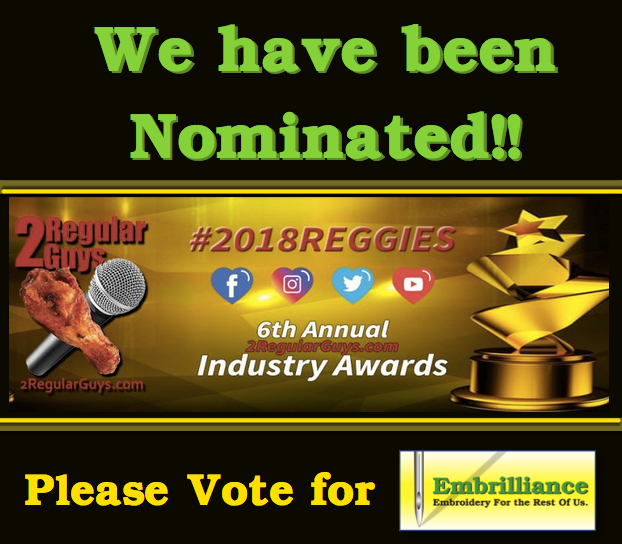 Click here to vote for Embrilliance in the 2018 Reggies!